There are many things in our life that cause fear. Many people fear failure. Some fear success. Some fear what others are going to think of them. Some fear the pain they must go through to reach a difficult goal. Fear is a common emotion that we all must battle. However, the successful people in life understand the key to overcoming fear is not eliminating it, but rather choosing courage instead. It’s being afraid, but going on anyway. If you choose fear, then it will paralyze you, and keep you from taking action. Fear always limits your potential. Fear always limits your potential. Choose faith over fear! Click To Tweet It will set you back, and sabotage your success. Choosing courage means you focus on your faith, and your inner belief that anything is possible. Choosing courage means you understand that failure is not fatal, and neither is it final. It means it doesn’t matter what anyone else thinks, or says, or does. Choosing courage over fear means you are going to take action! It’s ok to have fear, but it’s not ok to allow that fear to keep you from stepping out and taking a risk you know in your heart you should take. Fear leads to excuses. We often mask our fear by making excuses. We use the excuse of not having time, or not having money, or not being ready. Fear will lie to you. The little voice in your head that says, “Just keep things simple”, or “Things are fine just the way they are”, or “You don’t really want to take that risk”. 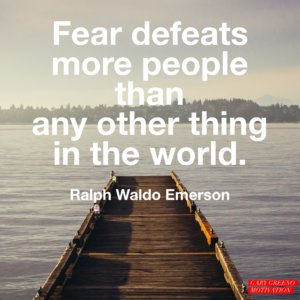 What have you been putting off because of fear? What goal, what dream, what great thing do you want to pursue? Don’t listen to the lies of fear, and stop making excuses. It’s time to choose courage, and know that your dream can be bigger than your fear. It’s all a matter of choice. Nurture your courage. The more you focus on the positive, the more the negative will shrink away. You were born for a purpose. You have a calling to be great. Take action, take a risk, and don’t allow anything to keep you from living out your purpose. Awesome post! Much of my life was characterized by fear and being manipulated through fear. I’ve been set free but every day I still have to choose. When I realize I’m feeling fear or that fear is lying to me, I let that be fuel for courage and take the next step of action! Thanks for posting! Thanks Robin! What a great story you have to inspire others!